If you can’t make it to Vermont this foliage season, you can find some gorgeous Fall scenery in Vermont.com’s Autumn Photo Gallery, thanks to local photographers and visitors to Vermont… But truly, you’ve got to be here to fully enjoy the leaves. 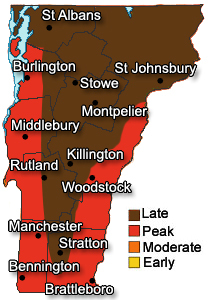 The map is an approximation of the foliage color progression throughout the season. The changes generally spread from the higher, cooler areas of the Green Mountains down into the Champlain and Connecticut River Valleys (moving from north to south across Vermont). Checkout the Vermont.com Calendar of Events to find great foliage events of all types throughout the state. Don’t see the event you’re looking for? Feel free to suggest an event so we can add it to our Calendar. We hope you come see the beautiful fall colors of Vermont! Keep checking back here as we continue to gather information to report foliage conditions throughout the state! If you’d like to be on Vermont.com’s “Leaf Squad” to help report the Foliage conditions in your area of the Vermont, please contact us! Parts of our updates are thanks to the USDA Forest Service, the Vermont Department of Tourism, and various “Leaf Peepers” around the state. You can find additional details by calling Vermont’s Seasonal Hotline at (802)828-3239 … and tell them Vermont.com sent you! This entry was posted in Fall Foliage on October 16, 2012 by Vermont.com Staff.